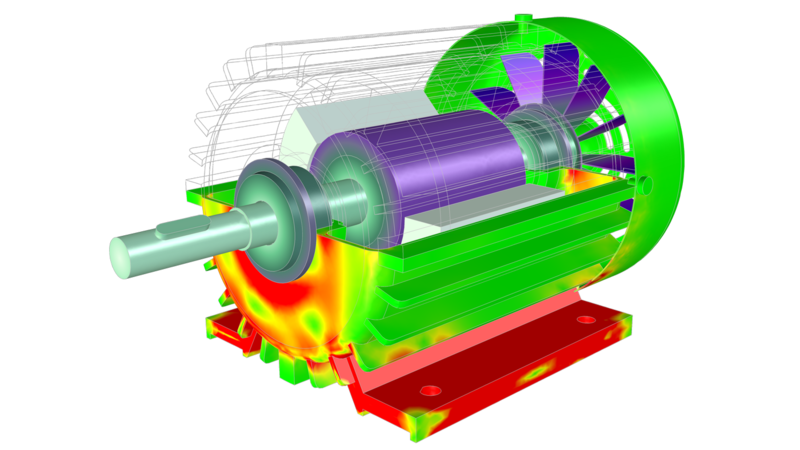 Analyzing electromagnetic systems and processes that encompass static and low-frequency ranges requires a powerful and flexible simulation tool. 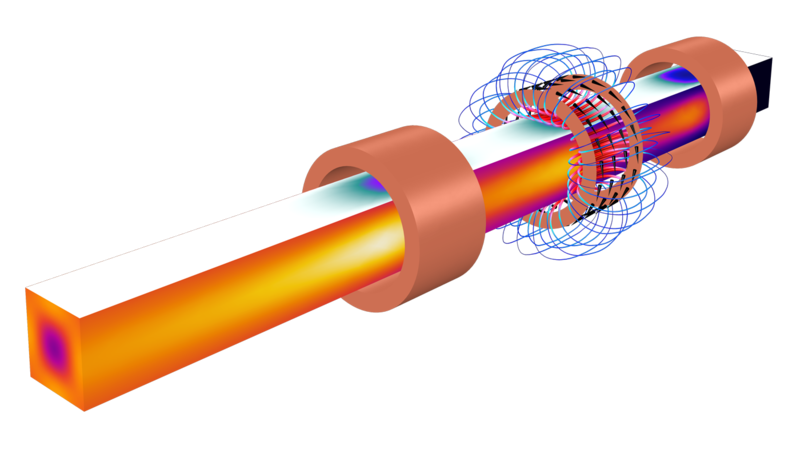 The AC/DC Module add-on to the COMSOL Multiphysics® platform provides you with a wide range of modeling features and numerical methods for investigating electromagnetic fields and EMI/EMC by solving Maxwell's equations. 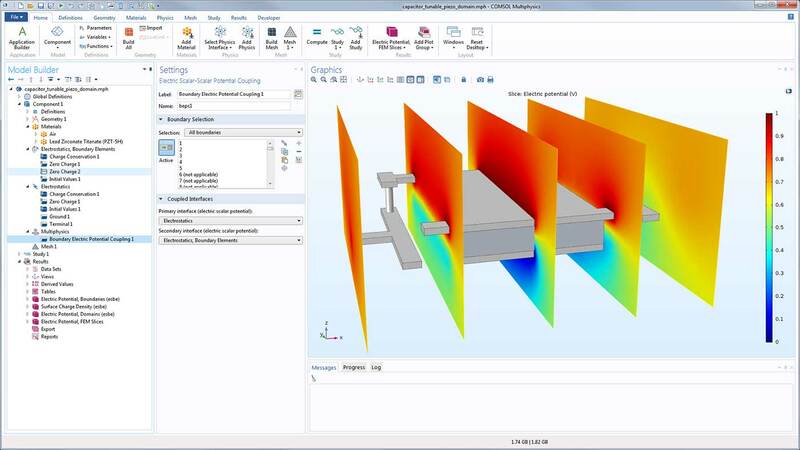 The multiphysics capabilities of the COMSOL® software make it possible to investigate the impact of other physical effects, such as heat transfer, structural mechanics, and acoustics, on an electromagnetics model. When you expand COMSOL Multiphysics® with the AC/DC Module, you unlock features for specialized low-frequency electromagnetics modeling in addition to the core functionality of the COMSOL Multiphysics® software platform. An E-core transformer example model that takes into account the effect of a nonlinear B-H curve in the soft-iron core. The results include the magnetic and electric fields, the magnetic saturation effect, transient response, and more. 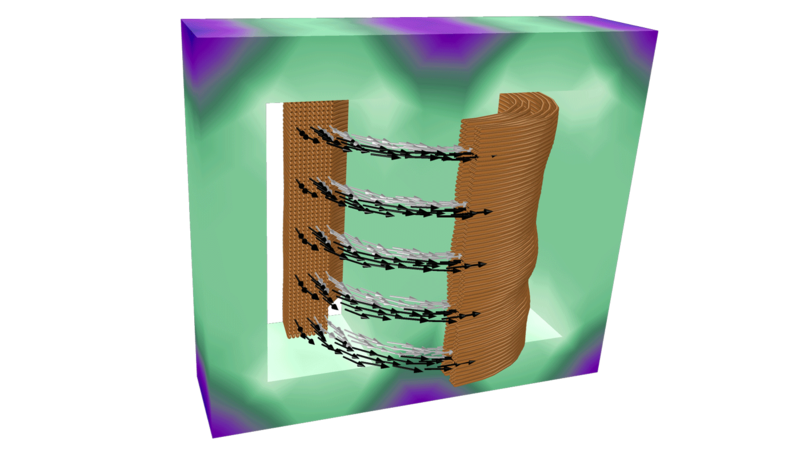 The temperature in a steel billet is shown as well as the magnetic field around and current within the coils. Explore the features and functionality of the AC/DC Module in more detail by expanding the sections below. The AC/DC Module comes with a selection of physics interfaces for setting up analyses in a number of application areas, such as electrostatics, electric currents, magnetostatics, and time-varying electromagnetic fields including induction effects. You can form combinations of these interfaces to get more general modeling capabilities. Did You Know? A physics interface is a user interface for a specific physics area that defines equations together with settings for mesh generation, solvers, visualization, and results. A tunable capacitor is modeled with a hybrid FEM-BEM approach with an automatic coupling between the two in order to compute the electric potential. In addition to fundamental boundary conditions — such as potentials, currents, charges, and field values — a range of advanced boundary conditions are included. Some of these, including the Terminal, Floating Potential, and Circuit Terminal boundary conditions, are used to extract equivalent circuit parameters from a 2D or 3D model such as resistance, capacitance, inductance, and impedance values and matrices. A touchscreen device model. Electrodes are frequently modeled with fixed potential, charge, or current values together with floating potential conditions for metallic surfaces of unknown potential. 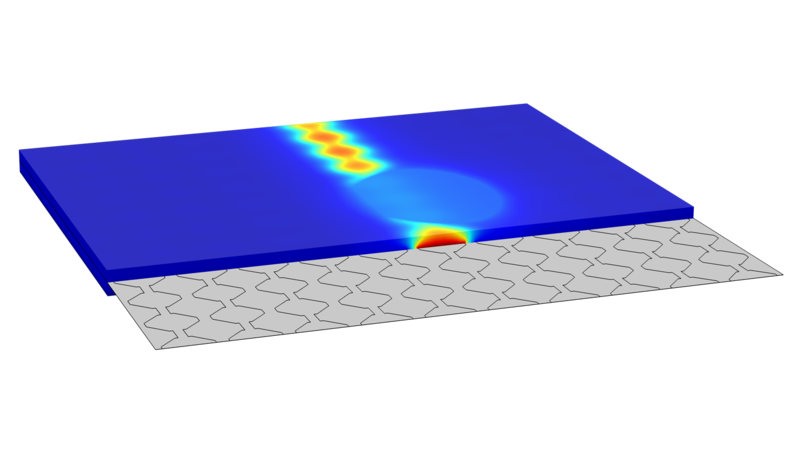 For modeling very thin structures, you can use shell formulations that are available for direct currents, electrostatics, magnetostatics, and induction simulations. A specialized user interface is available for modeling direct currents in shells with multiple layers. Electromagnetic shell modeling makes it possible to replace the thickness of a thin solid in a CAD model with a physical property of a surface resulting in a much more efficient representation. For accurate modeling of unbounded or large modeling domains, infinite elements are available for both electric and magnetic fields. For electrostatics and magnetostatics modeling, the boundary element method (BEM) is available as an alternative method for modeling large or infinite regions and works in combination with physics interfaces based on the finite element method (FEM). Specialized coil features can be used to greatly simplify the setup process of coils for a range of magnetostatics and low-frequency electromagnetics models. 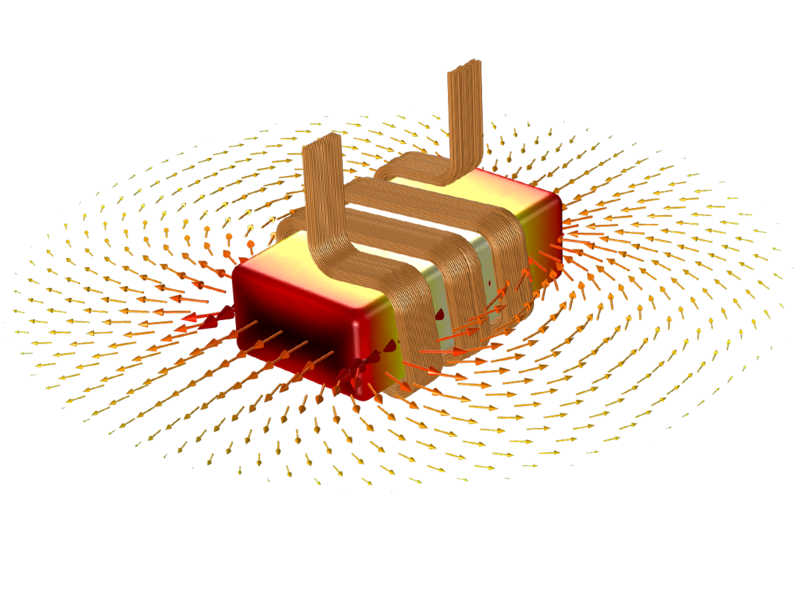 In many such applications, the magnetic field is generated by electric currents flowing in conductive materials; for example, cables, wires, coils, or solenoids. The specialized coil features are used to easily model these structures and to translate lumped quantities, like currents and voltages, into distributed quantities, such as current densities and electric fields. 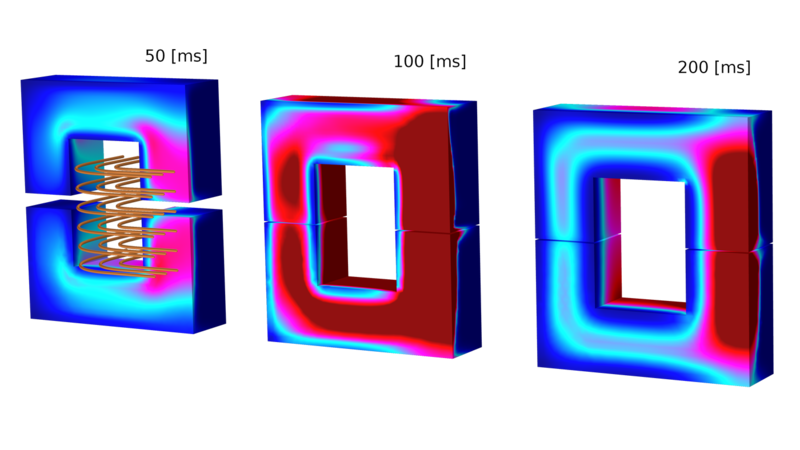 Single-conductor and homogenized multiturn coils can be defined in full 3D or 2D axially symmetric models. 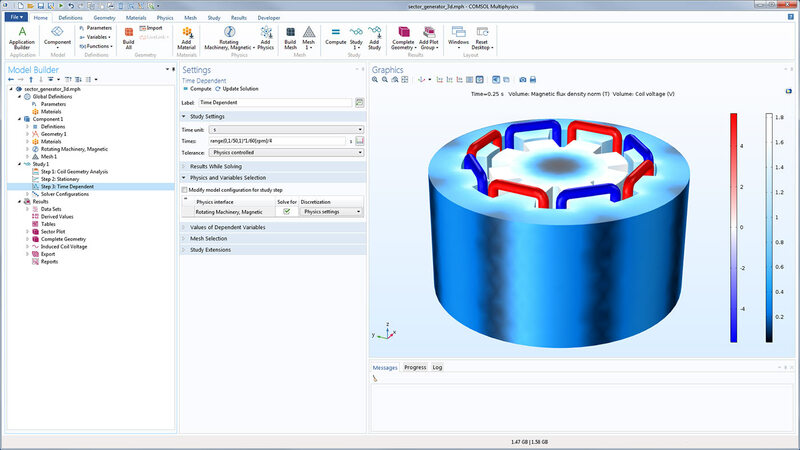 A part library, with fully parametric coil and magnetic core shapes, enables faster model setup when analyzing transformers, inductors, motors, and actuators. Using the built-in interface for rotating machinery, it is easy to model motors and generators. You can, for example, understand the behavior of induction or PM motors, particularly by capturing the eddy current losses that occur within the magnets. In any model that is used for simulating electromagnetic motion, you can examine the rigid or flexible body dynamics under the influence of magnetic forces and torques, induced currents, and mechanical load and spring configurations. A general-purpose moving mesh functionality makes it possible to model linear motion. This is important for understanding the operation of components involving plungers, such as in magnetic power switches and general actuators. A submarine is modeled with thin structures via the Magnetic Shielding boundary condition. The magnetic signature can be found at large distances with the boundary element method. In addition, you can use materials from libraries made available by other add-on products. Materials can be spatially varying, anisotropic, time-varying, lossy, complex-valued, and discontinuous. It is easy to expand the scope of a simulation with little additional work. You can define your own materials using mathematical expressions, look-up tables, or combinations of both. Alternatively, you can use externally defined materials written in C-code. More generally, by using the equation-based modeling functionality, you can modify boundary conditions, material properties, and equations to customize a simulation for your specific needs. A Jiles-Atherton anisotropic hysteretic material model is used to model the magnetic field in an e-core model, with the results showing a B-H curve and the magnetic flux density norm. The AC/DC Module offers automatic, semiautomatic, and adaptive mesh generation. Under the hood, the AC/DC Module formulates and solves Maxwell’s equations using FEM, BEM, or a combination of both methods, in concert with state-of-the-art solvers. Several types of finite element and boundary element mesh elements are available. It is easy to include multiple solver steps by adding studies. In this generator example, Coil Geometry Analysis, Stationary, and Time Dependent studies are added all at once in sequential order. Default visualizations are automatically adapted to the interface you have used and include plots of electric and magnetic fields, currents, charges, and voltages. You can easily add custom visualizations of any field quantity as well as composite expressions of field quantities and their derivatives. The postprocessing tools can be used to generate lumped parameter matrices, such as capacitance or impedance matrices, as well as integrated, averaged, maximum, and minimum values. 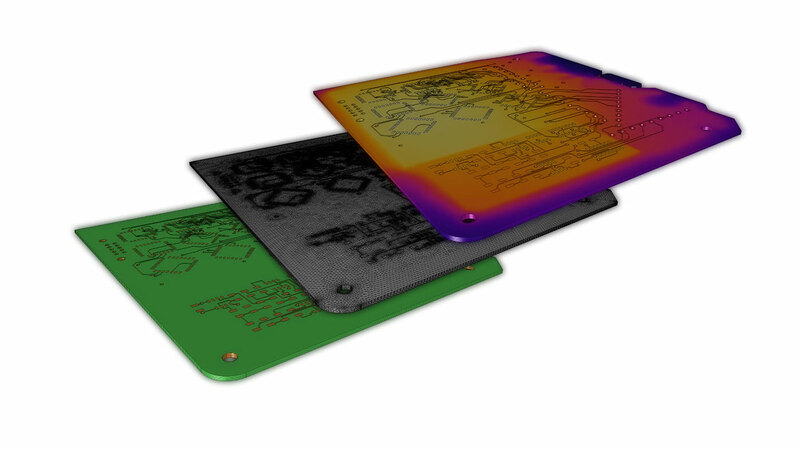 For example, you can use a maximum field evaluation to make sure the dielectric strength is not exceeded anywhere in your model, or get the total charge by integrating the charge density over a set of surfaces. By using cut-lines and cut-surface, it is possible to examine the field values on arbitrary cross sections of a model. The opening and closing of a power switch is modeled and then visualized with postprocessing tools. The electric losses are shown for three different times, simultaneously. Make your simulation process more efficient with the built-in Application Builder by turning your models into specialized applications with customized inputs and outputs. You can distribute the applications you make to colleagues without simulation expertise so they can perform repetitive analyses on their own, streamlining the design process. You can expand the capabilities of simulation throughout your team, organization, classroom, or customer/vendor base by building and using simulation apps. The Touchscreen Simulator app was created with COMSOL Multiphysics® and the AC/DC Module. By building apps like this one, you can help streamline the EM device design process. 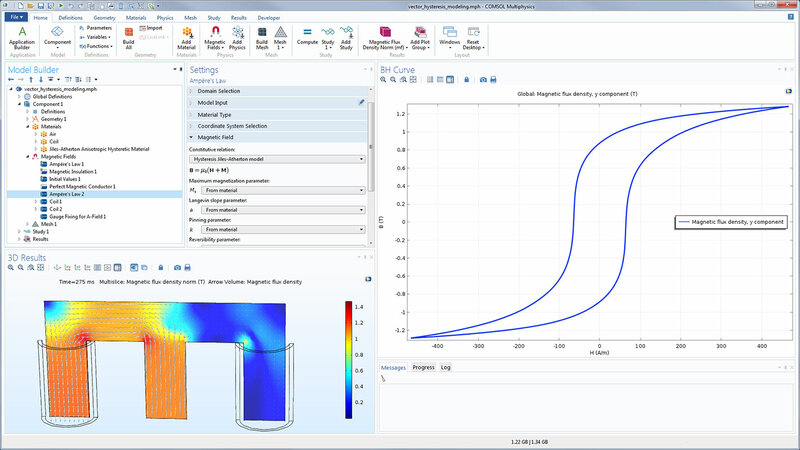 If you use the MATLAB® software, you can easily drive COMSOL Multiphysics® simulations with MATLAB® scripts and functions. The LiveLink™ for MATLAB® interfacing product enables you to access COMSOL® operations through MATLAB® commands and blend these commands with your existing MATLAB® code, directly within the MATLAB® environment. In order to make it easy for you to analyze electromagnetic properties of CAD models and electronic layouts, COMSOL offers the ECAD Import Module, CAD Import Module, Design Module, and LiveLink™ products for leading CAD systems as part of our product suite. The LiveLink™ products make it possible to keep the parametric CAD model intact in its native environment but still control the geometric dimensions from within the COMSOL Multiphysics® software, as well as produce simultaneous parametric sweeps over several model parameters. You can also synchronize Microsoft® Excel® spreadsheet data with the parameters you define in the COMSOL Multiphysics® environment via the LiveLink™ for Excel® interfacing product. View all available interfacing products in the product suite. 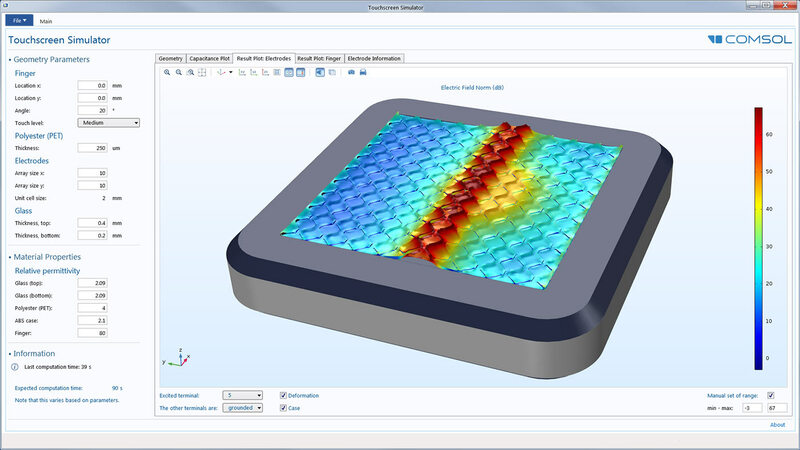 An IPC-2581 test file of a six-layer PCB was imported into COMSOL Multiphysics® with the ECAD Module for simulation analysis. Test case courtesy of Cadence Design Systems, Inc. The products, devices, and components you design for the static or low-frequency range need to operate safely in the real world. For a comprehensive analysis, use the COMSOL Multiphysics® software and the AC/DC Module to see how multiple physics affect your design. Most electromagnetic components, devices, and products are affected by another branch of physics, whether it be heat transfer, structural mechanics, or acoustics, to name a few. For the most accurate study possible, you can examine a variety of these effects simultaneously. 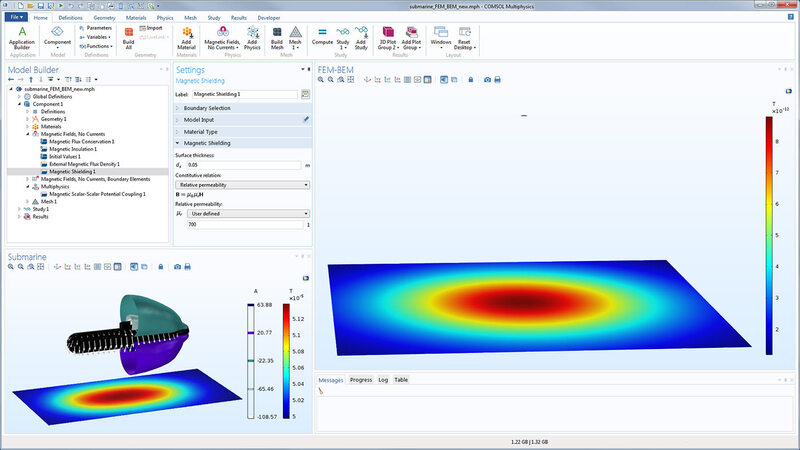 The COMSOL Multiphysics® platform enables you to couple multiple physical effects in one software environment. An induction motor is modeled with the AC/DC Module and the Multibody Dynamics Module to account for electromechanical effects. The von Mises stress distribution in the housing is shown.